2 Fishery Cottages is a detached, beautiful property located in the village Bundoran in Co Donegal in Ireland and can sleep ten people in five bedrooms. All of the bedrooms are doubles with two on the ground floor and three doubles on the second floor, as well as a bathroom on the ground floor and a shower room on the first floor. The rest of the cottage is made up of a kitchen with dining area, an open plan living dining area, as well as two sitting rooms, and to the outside there is ample off road parking and an enclosed gravelled garden. 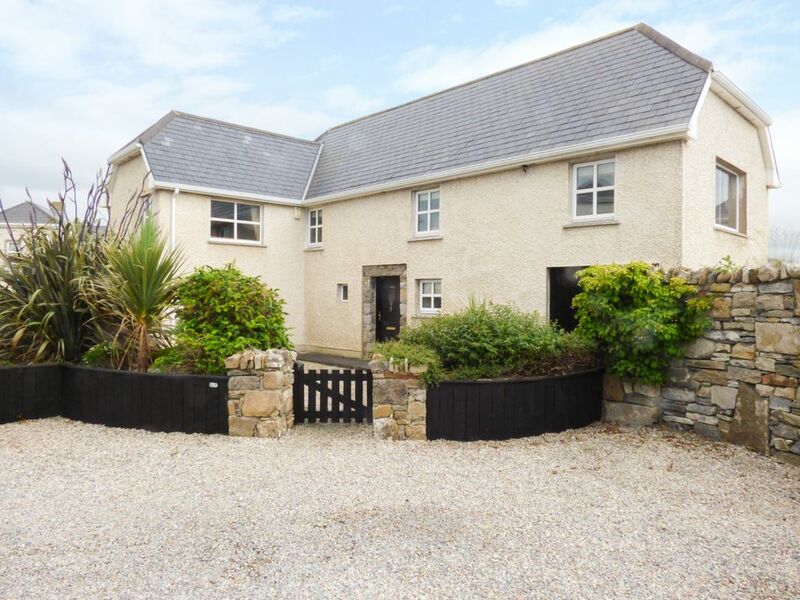 Located right on the sea front, this beautiful property, it the perfect coastal retreat for a group of friends or large family! Amenities: Gas central heating. Electric oven and electric hob, microwave, fridge/freezer, washing machine, tumble dryer, dishwasher, TV with Freeview, selection of books and games. Bed linen included in rent. Cot and stairgate available. Ample off road parking. Enclosed gravelled garden. One well-behaved dog welcome. Sorry, no smoking. Shop, pub and restaurant 1 mile. Note: There are two stair cases in the property and one set are open tread and one is a solid stair case. May not be suitable for small children or anyone with mobility issues. Town: The coastal town of Bundoran, meaning the foot of the little water is situated in County Donegal and is one of Irelands most popular resorts. You could visit Bundoran Adventure Park, Waterworld, take cliff-top walks around the town or playing golf on one of the many courses. Close by is Ballyshannon, the oldest town in Ireland, which boasts a folk festival every August and offers shops selling local crafts, pubs, restaurants, a leisure centre and a beach. Over three floors. Five bedrooms: 3 x ground floor double (one with en-suite WC), 2 x second floor double. Ground floor bathroom with bath, shower over, basin and WC. Shower room with walk-in shower, basin and WC. First floor kitchen with dining area. First floor dining room with sitting area. First floor sitting room. First floor second sitting room. Utility. Gas central heating. Electric oven and electric hob, microwave, fridge/freezer, washing machine, tumble dryer, dishwasher, TV with Freeview, selection of books and games. Bed linen included in rent. Cot and stairgate available. Ample off road parking. Enclosed gravelled garden. One well-behaved dog welcome. Sorry, no smoking. Shop, pub and restaurant 1 mile. Note: There are two stair cases in the property and one set are open tread and one is a solid stair case. May not be suitable for small children or anyone with mobility issues. We booked this property for a New Year family gathering on the basis that it had a wood burning stove. However on arrival we found a note stuck to the stove saying it was out of order. We were very disappointed and have raised the issue with Sykes.